Football star Cristiano Ronaldo. While big money purchases by big clubs always capture popular imagination, what is often overlooked is the quiet enterprise of certain European clubs that thrive on their reputation as prolific ‘selling clubs’. Photo: AFP. On 31 August, as the curtains fell on yet another transfer window in European club football, the headlines were dominated by the high-profile sale of Cristiano Ronaldo to Juventus. While big money purchases by big clubs always capture popular imagination, what is often overlooked is the quiet enterprise of certain European clubs that thrive on their reputation as prolific ‘selling clubs’. These include Benfica, Porto and Sporting Lisbon from Portugal; Ajax Amsterdam in the Netherlands; Dinamo Zagreb from Croatia; and Lyon and Monaco in France. Some of the most illustrious footballers in the world have spent some of their instrumental formative years in one of these clubs. Luis Suarez at Ajax rose from relative obscurity to a prized footballer, enabling a transfer to Liverpool for €26.5 million, against a purchase price of €7.5 million. Teenage prodigy and world cup phenomenon Kylian Mbappe, who came through the ranks in Monaco’s youth set-up, fetched the principality club €135 million for his transfer to Paris Saint-Germain. 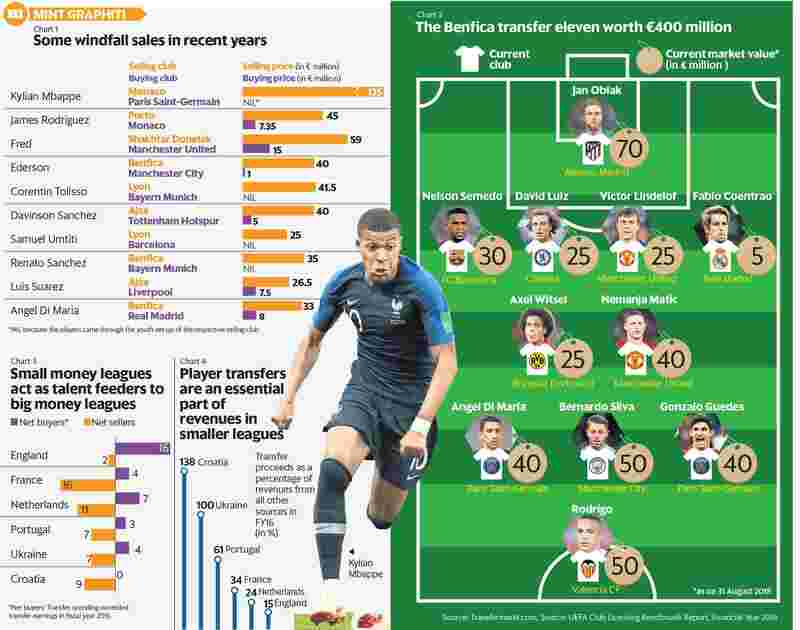 For clubs like Porto and Ajax, player sales like these are both about push and pull. Even though they are leaders in their respective leagues, their economic clout, as well as allure, is significantly smaller than the biggest in England, Spain, Germany, France and Italy. So, when big clubs, such as the Manchester duo or a Real Madrid or a Bayern Munich, circle in on their talent, they can’t match the player wages or their aspirations (chart 1). At the same time, these clubs covet such windfalls, to the point where player sales—buy low, sell high, in quick time—have become an intrinsic part of their business model. The profits from transfers help scout and sign the best young players from smaller clubs, while remaining dominant in their respective leagues. According to the UEFA club licensing benchmark report, released in January 2018, Benfica made a net profit of €20 million in FY16, riding on large transfer gains. Such is Benfica’s influence as a feeder team that if an eleven were drawn from players the Portuguese club offloaded, they would compete well with the best in Europe (chart 2). Clubs such as Benfica specialize in identifying young talent through their extensive scouting networks and training them through world-class facilities. They also offer valuable playing time that often serves as an audition for the largest football clubs. French club Lyon, which has groomed the likes of Barcelona defender Samuel Umtiti and Bayern Munich midfielder Corentin Tolisso, ranked fifth among all European clubs in total investment in stadium and facilities in FY16. There is a clear national hierarchy in terms of buying and selling clubs. In 2015-16, the English top flight had the highest number of clubs that were net buyers (transfer spending exceeded transfer earnings). In the Croatian league, on the other hand, all clubs were net sellers. The relative importance of transfer proceeds to clubs also varies substantially across leagues. For Croatian clubs, the amount of transfer proceeds (measured separately) is 138% of revenues from all other sources. In England, this number is just 15% (charts 3 and 4). There are also other factors that may explain these clubs’ success. Portugal benefits from its cultural proximity to the footballing hotbeds of Latin America. Lisbon has more direct flights to South America than any other European city. In France, a network of nationally sponsored academies is instrumental in scouting young footballers. Immigrant communities, mostly of African descent, residing in the suburbs of major French cities, also serve as a massive reservoir of young footballing talent. For Ukrainian giants Shakhtar Donetsk, the arrival of Romanian coach Mircea Lucescu, who is fluent in Portuguese, backed by multi-millionaire owner Rinat Akhmetov’s vision to showcase attractive football, ushered in a wave of Brazilian talent. Fans of these selling clubs are desperate for their teams to outgrow their reputation as feeder clubs. Holding on to world-class players like Luka Modric and Luis Suarez would enable them to compete with the best in Europe. However, the current commercial construct in Europe ring-fences such ambitions, leaving them with no option but to carve out niches as feeder clubs to the European footballing elite.